CertifyMe.net has been known for years as the industry’s leading provider of lift operator training and certification. What many people don’t know is that CertifyMe also provides the same fast, convenient and affordable HAZMAT training that’s required for working with hazardous materials. The Department of Transportation (DOT) defines hazardous materials (HAZMAT) as substances or materials that could harm or endanger hazmat employees or the general public. DOT defines a hazmat employee as any person or entity involved with the handling or transportation of hazardous materials, including businesses and self-employed people. DOT HAZMAT training is important, and it’s also required. It’s the employer’s responsibility to see that all hazmat employees are properly trained. This required training includes DOT HAZMAT general awareness, safety and security classes. Failure to comply can result in substantial penalties, including civil fines of $27,500 per incident. In extreme cases, criminal fines of up to $500,000, five years in prison or both can be imposed. All required DOT HAZMAT training is available online through CertifyMe.net, whose interactive training courses are 100% OSHA approved. ✓ DOT HAZMAT General Awareness Training is intended for all employees who handle and transport hazardous materials. It’s designed to make employees aware of situations under which they might encounter chemicals and other dangerous materials, along with the risks related to working with them. As with our other interactive courses, DOT HAZMAT General Awareness Training combines audio, video, text and graphics. The General Awareness Training can be taken by itself or in combination with our DOT HAZMAT Safety Training course. ✓ DOT HAZMAT Safety Training covers how to safely handle hazardous material and comply with the regulations that control these activities. DOT HAZMAT Safety Training covers how to respond to emergencies and protect employees from exposure to hazardous materials. The course also includes procedures for avoiding accidents both in the workplace and while being transported. Just like our other courses, the online interactive training is divided into a series of logical sections, which makes it easy to understand and retain the information. 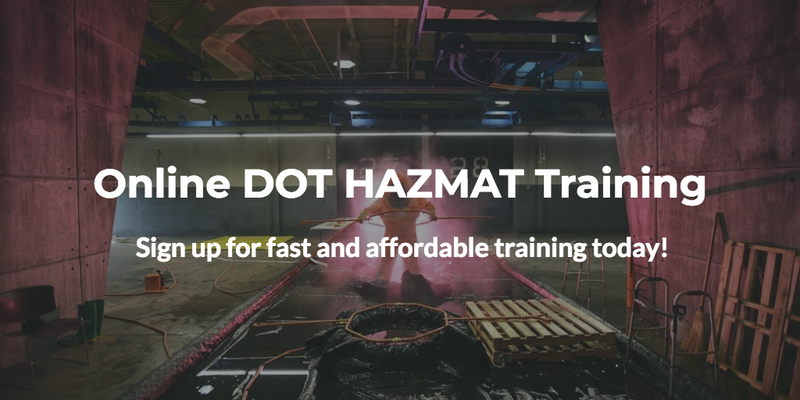 ✓ DOT HAZMAT Security Awareness Instruction focuses on making employees who work with hazardous materials aware of the security risks associated with transporting them, including ways to increase security while they are being transported. CM’s Security Awareness Training also includes a section on how to recognize and react to potential security threats. ✓ DOT HAZMAT In-Depth Security Training goes beyond basic Security Awareness. It includes establishing security objectives, organizing the internal security structure and implementing security procedures. The course also covers how to assign security-related duties and responsibilities to individual employees, as well as the actions employees are to take if a breach in security should occur. All new hazmat employees or those who change job functions are required to complete DOT HAZMAT training within 90 days. These employees can, however, work with hazardous materials before they’ve completed the courses, provided they’re under the direct supervision of a properly trained and qualified hazmat employee. All hazmat employees are required to receive DOT HAZMAT recertification every three years. The fastest, easiest and most affordable way for you or your employees to receive OSHA approved DOT HAZMAT training and recertification is through CertifyMe.net’s Online Certification Courses. Call us today at 888-699-4800 or contact us online to get started on your way to becoming OSHA and DOT compliant and making the workplace safer for all concerned.